Volunteers at the Copa de Leche care placement recently organized a lesson with the children to teach them the importance of brushing their teeth. Copa de Leche is a dining hall located in a very poor neighborhood of Córdoba. The dining hall offers neighborhood children an afternoon snack, a drink, and a safe place to play. The volunteers not only prepare the snack and juice for the kids, but are also responsible for organizing activities for the children, from sports, games and arts & crafts. Volunteers spend a lot of time with the kids at the Copa de Leche, and it was noticed that many of the children have very dirty teeth and at a young age, were already losing teeth due to decay and lack of care. Our volunteers decided to turn this into a learning opportunity to educate the children on the importance of dental hygiene. The volunteers made posters with illustrations of the mouth and the teeth. With the help of their volunteer coordinator they explained the importance of daily brushing. They showed them how to brush their teeth using the illustrations. They then look the lesson outside with glasses full of water, 45 toothbrushes and 45 very excited children. The kids loved it as many had no idea how to clean their teeth. 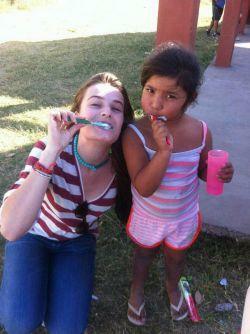 Luciana, a 6-year old girl was really happy with her new toothbrush. Ramiro, also six years old, showed us his very white teeth for the rest of the day and kept repeating: two times a day, in the morning and before going to bed. The day was a great success for both volunteers and children.